The Obama administration has sided with the broadcasters in Aereo's looming Supreme Court battle. The Obama administration has sided with the nation's television broadcasters in a pending Supreme Court case against Aereo, the Internet service that scoops up freely available television signals and streams them to paying subscribers. A joint filing by the Justice Department and the United States Copyright Office, made public on Monday, found that the Aereo "system is clearly infringing" and recommended that a lower court ruling in Aereo's favor be reversed. Such a ruling would likely put Aereo out of business and protect the broadcasters from similar challenges in the future. Aereo declined to comment on the filing. Supreme Court oral arguments in the case are scheduled for April 22. The government's support for the broadcasters came in the form of an amicus brief, which the Justice Department's solicitor general frequently files to express the United States' interests in cases it is not a party to. Aereo, which is backed by former Fox (FOX) network president and current IAC (IACI) chief Barry Diller, uses thousands of tiny antennas to receive local stations' signals, then streams the signals to paying subscribers -- one antenna per viewer -- over the Internet. Aereo argues that this is akin to setting up a single antenna and watching television the old-fashioned way. But broadcasters say that this is a blatant violation of the Copyright Act's restrictions on public performances of copyrighted works, in this case their television shows. So a group of broadcast network owners have tried to sue Aereo out of existence. 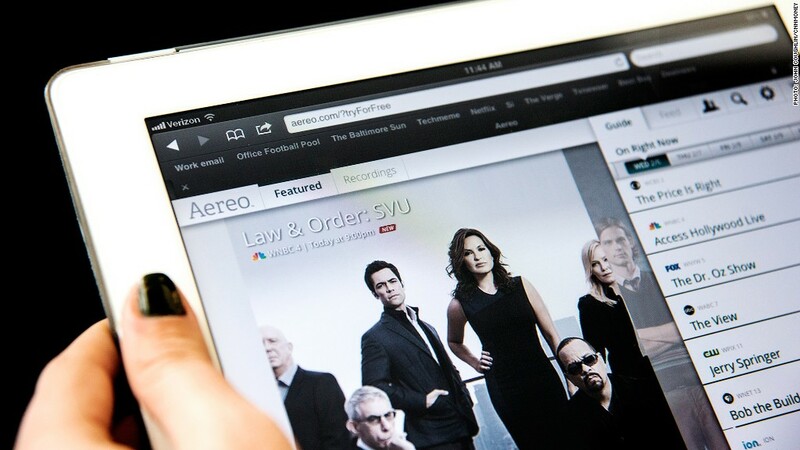 Broadcast television executives say Aereo, and services like it, could gravely undermine the broadcast business model. They argue that if Aereo is found to have solid legal standing, then the big cable and satellite companies that currently pay hefty retransmission fees might stop paying and set up their own Aereo-like antenna arrays instead. Retransmission fees have become a critical second revenue stream for broadcasters, offsetting declines in advertising revenue. But Aereo says its service is entirely legal, and most lower courts have sided with it. That spurred broadcasters to ask the Supreme Court to hear the case last October. The court agreed in January. It was a David vs. Goliath case then, and the government's filing on Monday reinforces that. The amicus brief concluded that comparing Aereo to a single antenna at home is "inapt" and that the service is "plainly engaged in public performances" as depicted in the Copyright Act. Aereo and its allies have warned that a Supreme Court ruling against it would also threaten the emerging industry of cloud-based media storage, but the government suggested otherwise. The filing said a ruling that deems Aereo illegal "should not call into question the legitimacy of businesses that use the Internet to provide new ways for consumers to store, hear, and view their own lawfully acquired copies of copyrighted works." That is significant because television distributors like Cablevision (CVC) have introduced cloud-based digital video recorders that give new flexibility to consumers and companies. Cablevision filed its own amicus brief on Monday saying that Aereo "steals television programming from content owners," but warning that a broad Supreme Court ruling against Aereo could also jeopardize its own cloud-based technology. The National Association of Broadcasters, a lobbying group for local television stations, said it supported the administration's position.